Imagine a world where the secret to immortality has been discovered, causing women to stop aging by the time they turn twelve. Sounds like it might be a perfect playground for a discoverer with less-than-wholesome interests, doesn't it? That's exactly why the Big Man Upstairs sends Dokuro-chan, one of his angelic assassins, into the past to "deal" with the sicko who messed with nature. 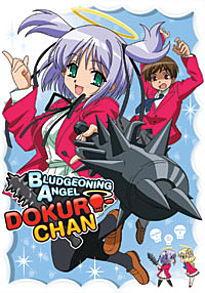 But Dokuro-chan decides instead to move in with her target, Sakura Kusakabe, and keep him too occupied to find eternal life. Funnily enough, the path of nonviolence leads to a fountain of blood, as Dokuro-chan accidentally kills Sakura on an almost daily basis, only to resurrect him with a magical chant moments later.